A the hour beyond memory set th' wind at me sails. Once a jim laddie wit' dreams 'o th' ocean, turned scurvy pirate 'o th' savage seven seas, 'tis Lord Dalgrim fancies himself a deity amongst sailors. A mighty fleet he had set ahead to seek out more treasure, returned naught but stain'd paper wit' scribble no more worth readin than all th' books he'd burned b'fore. No doubts calls fer help a scribbled by a scallywag callin h'self cap'n! Nay, th' treasure be not worth me the hour so I toss'em in th' waters from whence they come! The Renaissance staff are proud to unveil our Player Rewards System. 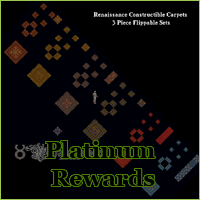 Where players can earn platinum coins in their adventures or other chosen profession and trade them in for unique and innovative items. Next on our quest for "History Perfected" is the masonry crafting system. Added to OSI shards in 2001 this was a disaster in application. 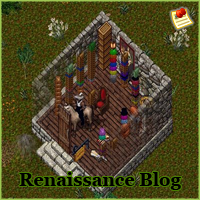 The staff here at Renaissance have rebuilt this system from the ground up to make it a rewarding trade for players, while maintaining an appropriate level of difficulty in acquiring the items. 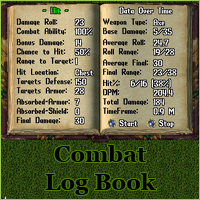 Given the wide variety of combat templates available to players on Renaissance server the staff has created the ultimate tool for analyzing your characters combat proficiency. 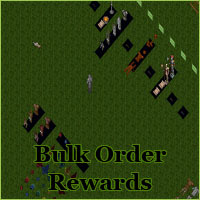 Continuing on our path to History Perfected in this blog post we will look at the bulk order deed system, how it works and the rewards for completing the orders. 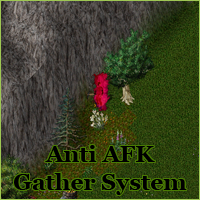 In order to combat the problem of unattended gathering and selling the Renaissance staff have created a system that will monitor these activities. Since no free shard can have staff online around the clock to respond to player complaints about unattended macro'ers an automated system was needed. The next step on our quest to perfect the Renaissance experience was fixing what we have always thought was one of the most obvious mistakes with respect for housing. Castles were probably intended in design to be large guild houses from the beginning, however with the size of the courtyard and the general design make this almost impossible. 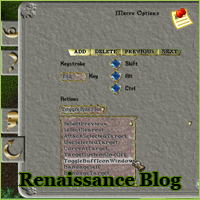 Continuing our mantra of "History Perfected" we have reviewed the tools available and researched the Buff Icons system that was created later in the history of Ultima Online. We customized this system in a manner that would integrate it into the Renaissance experience while staying true to our vision. One of our recent projects here at Renaissance was looking into ways to make players who dedicate their time and effort to being a craftsman more rewarding. With the advent of the Renaissance era we were provided with much improved crafting menus but unfortunately limited new crafting options. 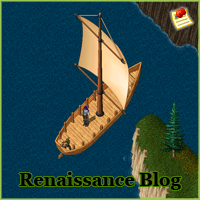 As a player I always thought it was strange that boat deeds were bought rather than crafted, and after some discussion we determined that adding boat construction would be a nice improvement to the crafting options. 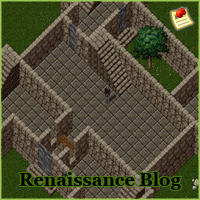 On our quest to perfect the Renaissance era of Ultima Online we realized that several classic houses were in desperate need of a few changes. 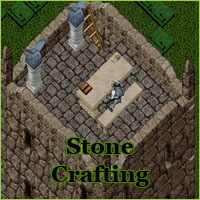 As longtime players we could never understand why stone keeps had so much wasted space. To address this we have created a "large stone keep deed". By removing two of the empty wells on the east and west sides of the keep we are able to establish more of a great room feel in the keep. Most significantly we are able to convert the back well into a private courtyard for the keep owner. 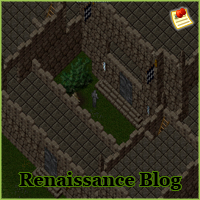 In 2012 the decision was made by a group of friends that there was a need for a true Ultima Online Renaissance era shard that was free from the influences of trammel and infused with the thrilling challenge that was Felucca and the T2A era. Over the next few months we plan to review every aspect of the Renaissance period and incorporate all the fantastic additions into the Felucca facet. 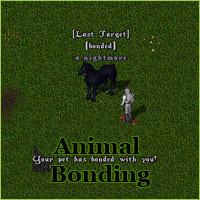 Some great things were added during this time, but some terrible mistakes were made also. 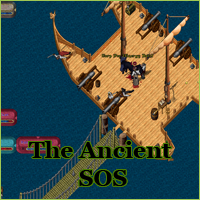 We aim to recreate this period as it should have been, but by staying true to the Second Age mechanics we all loved.